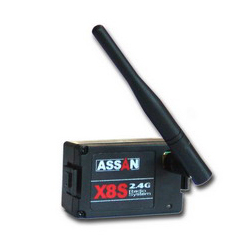 9 channels mini receiver with 30cm antenna for X8 2.4Ghz System, Compatible with all ASSAN's RF modules. EBE-II includes Electronic Ignition, Battery Voltage Monitor and UBEC, 3 in 1 on board. It's solid and easy use. Especially for that with narrow engineer operate space and not easy apply traditional Ignition. 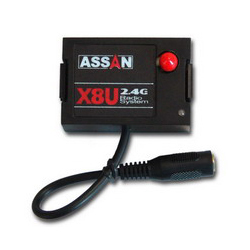 The ASSAN 6S LiPo Battery Monitor is one of the first Lithium Polymer (LiPo) battery monitor that take up big size 5 piece seven segment LEDs. 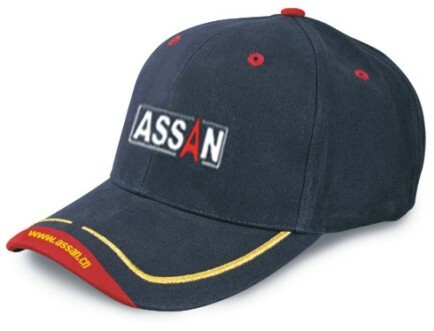 It uses a ultra bright LED that gives an advanced strength indication through its color. 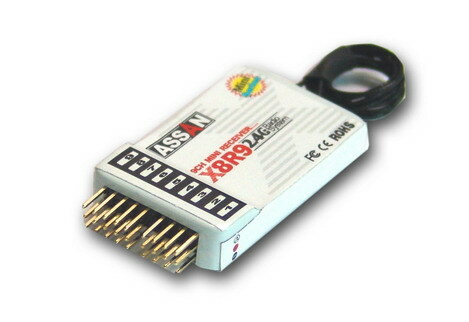 This 6S LiPo battery monitor is ideal for all electric R/C models such as helicopters, planes, cars, trucks and boats. This balance connector is common works with most popular Li-poly pack makers. 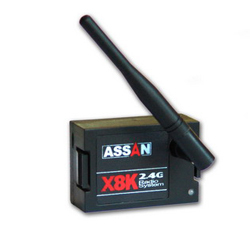 -Monitors wide range of Lithium Polymer batteries from 2-6 LiPo Cells (6V to 25.2V). -Simple one time toggle mini switch to auto learn connected fully charged LiPo cell battery pack. -Easy one touch switch to select between 3 different LED schemes. - Battery over-load condition indication. -Ultra low power consumption with operational voltage as low as 5V. -Optional high decibel buzzer for audible low battery indicator (sold separately). 1. 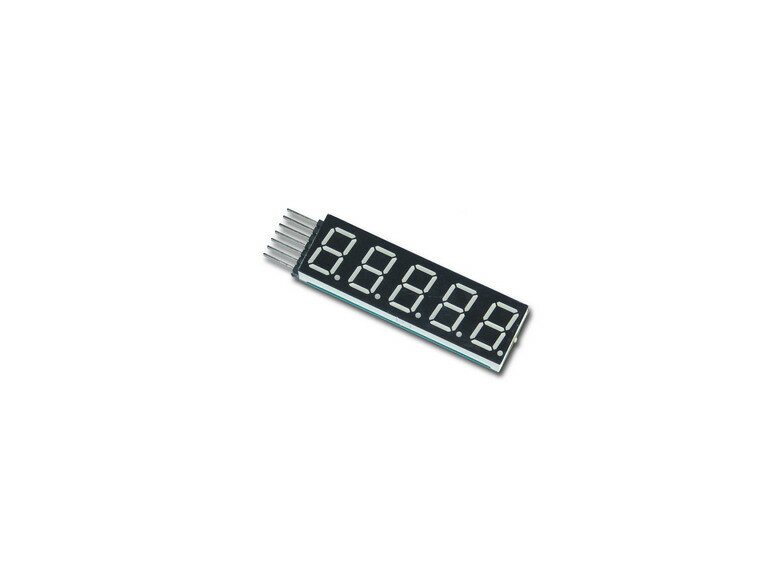 This Lipo Battery Cell Voltage Checker only good for 1 - 6 Cells Lipo Batteries ONLY. 4.Good for 1 - 6 Cells Lipo Batteries. Over the past couple of years and company with the technology improved quickly, your big size model such as helicopter, F 3C , truck model or robot begs for more power than the old one. The fast digital or heavy load Servos may need draw more than 2Aamp in starting or moving. 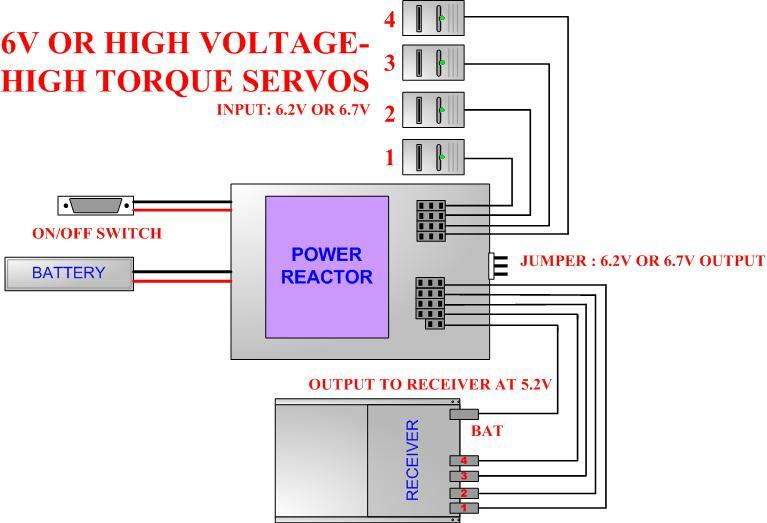 New high current, high voltage servos are now entering the R/C market place rashly. You need face that not all of them worked in the same Voltage. How to fix it? Did you need use different Extra BEC to supply the different Voltage and with complex wire connection? It's can't be imagine when you must make clear a couple of wires on spot. The Power Reactor was designed for that application. This unique with dual linear regulator supplies direct power through heavy duty connectors and wires . Power Reactor offers more power and safer operation. Combine with it, you can slove your problem easily.The faster servo response and more available current give your big size model with a whole new feeling. - Accepts 2S Li-poly battery pack input voltage. GA-4110 is our first digital lock-head gryo. The target is focus on that who want Futaba GY-401 quality but much cheap, and not need many 3D flying pilots. 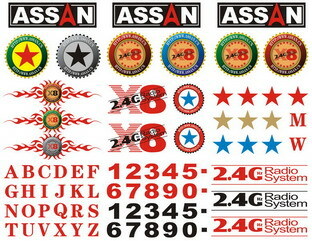 GA-411' s size and apperance similar as GY401, which means you will feel easy to install in your famialr position. With three swtichs to setting and ajust. Through many real flying tests, include in Trex 600 size heli.it's lock head behaviour is acceptable, easy use and solid. We like o introduce it to the customers and like it in your second learning period, means you are not flash guy in the spot.